GLOUCESTER, Massachusetts, February 1, 2012 (ENS) – The federal fisheries agency today announced a final decision to list five distinct population segments of Atlantic sturgeon under the Endangered Species Act. The Chesapeake Bay, New York Bight, Carolina, and South Atlantic populations of Atlantic sturgeon will be listed as endangered, while the Gulf of Maine population will be listed as threatened, the Northeast Regional Office of NOAA’s National Marine Fisheries Service said today. NOAA, the National Oceanic and Atmospheric Administration, says these listing decisions, which will take effect on April 6, will not have an immediate impacton fishing. It has been illegal to fish for, catch or keep Atlantic sturgeon, Acipenser oxyrinchus oxyrinchus, for more than a decade. Atlantic sturgeon are large, slow-growing, late-maturing, long-lived, estuary-dependent fish that live most of their lives in salt water, but hatch and spawn in freshwater. These sturgeons may live as long as 60 years, reach lengths up to 14 feet and weigh more than 800 pounds. While the historic range of Atlantic sturgeon included major estuary and river systems from Labrador to Florida, Atlantic sturgeon are now thought to be absent from at least 14 rivers they used historically, with spawning thought to occur in only 20 of 38 known historic spawning rivers. The most significant threats to the species are unintended catch of Atlantic sturgeon in some fisheries; dams that block access to spawning areas, poor water quality, which harms development of sturgeon larvae and juveniles; dredging of historical spawning areas; and vessel strikes. As a result, NOAA Fisheries determined that listing sturgeon under the Endangered Species Act is warranted. NOAA personnel will work with fishery management councils, interstate fisheries managers, state agencies, and the fishing industry to find ways to further reduce bycatch of Atlantic sturgeon in federal and state waters without unduly hampering fishing activities. For instance, NOAA continues to fund research to test modifications to fishing gear that can reduce bycatch of fish, including Atlantic sturgeon. A team of biologists from NOAA, the U.S. Geological Survey, and the U.S. Fish and Wildlife Service completed a formal status review for Atlantic sturgeon in 2007. 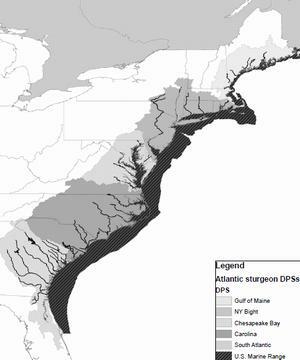 The review indicated populations of Atlantic sturgeon remain far below historical levels. In the Delaware River before 1890, there were an estimated 180,000 adult females spawning, and now the total number of spawning adults in that river is believed to number fewer than 300. Historical catch records indicate that these fish were once abundant, supporting important colonial fisheries. In the late 19th century, demand grew for sturgeon caviar and the first major U.S. commercial fishery for them developed. This lasted from about 1870 until the 1950s with landings peaking in 1890. The commercial fishery collapsed in 1901 when landings were about 10 percent of the peak. Populations continued to decline even after a moratorium on harvest and possession of Atlantic sturgeons was put in place in 1998. In 1997, NOAA received a petition from the Biodiversity Legal Foundation to list Atlantic sturgeon as endangered under the Endangered Species Act, but decided that listing was not warranted at that time. On October 6, 2009, the agency received a petition from the Natural Resources Defense Council to list Atlantic sturgeon throughout its range as endangered under the Endangered Species Act. In January 2010, NOAA announced the petition had merit and it would formally consider whether to list the species under the Endangered Species Act. In October 2010, NOAA proposed listing the species and sought public comment. NOAA received comments from 119 individuals or agencies, which were submitted in writing or during the six public meetings. While some comments opposed listing the species, no data was provided that conflicted with today’s final decision to list Atlantic sturgeon under the Endangered Species Act. Conservationists are pleased with the listing decision. 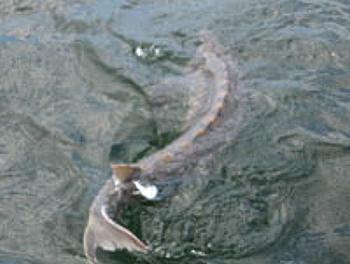 In the process of making this listing decision, NOAA first reviewed the best scientific and commercial data available, including recent information on commercial and recreational bycatch rates and effects of poor water quality on Atlantic sturgeon, and additional information submitted during the comment period. An 11-member team of Atlantic sturgeon experts from NOAA Fisheries, the U.S. Geological Survey, and the U.S. Fish and Wildlife Service drafted a status review report. Eight state and regional Atlantic sturgeon biologists reviewed and contributed information to the report, and the report was independently peer-reviewed by six other Atlantic sturgeon experts. NOAA’s proposed rule to list the five Atlantic sturgeon populations was submitted to three independent peer reviewers. Public comments on the proposed rule were accepted through a 120-day public comment period, which included six public hearings NOAA convened to solicit public opinion on the proposed listing. NOAA considered all comments, including any data or information supplied, prior to making a final decision that also reflects current science, regulations, case law, and agency guidance.